Kleemation for flute and piano is in five short movements based on five drawings by Paul Klee titled: Goodbye to You, Please!, Afraid on the Beach, More Will Be Marching Soon, and Woman Sowing Weeds. Described as "highly abstract yet accessible," the piece was commissioned by Austin Peay University in Tennessee and received its premiere there in 2003. The New England premiere was at the Duxbury Art Museum in 2004 by the duo "2" (flutist Peter H. Bloom and pianist Mary Jane Rupert). "2" has since performed the piece on tours in the U.S., Thailand, Australia, and New Zealand. Click to read a testimonial to Elizabeth Vercoe's composition Kleemation written by Mr. Bloom. Kleemation was recorded by "2" and can be heard on the PARMA Recordings all-Vercoe CD entitled Kleemation and Other Works by Elizabeth Vercoe. 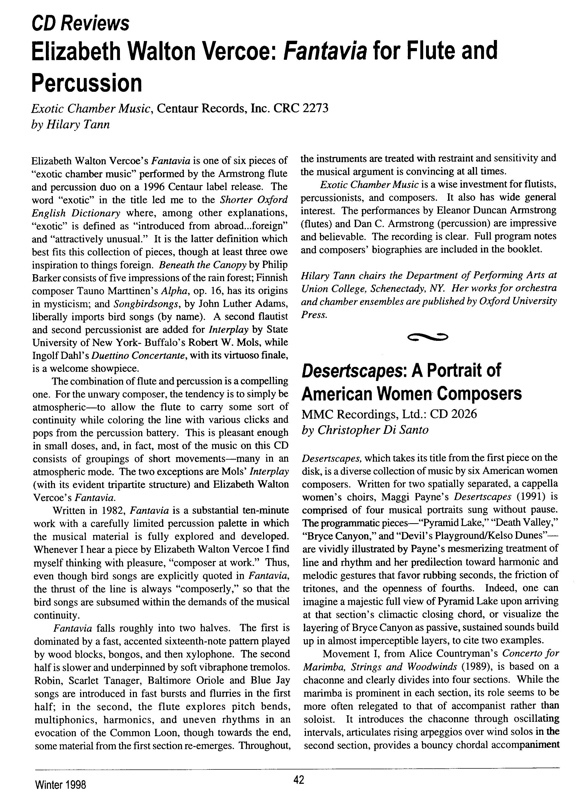 In an IAWM Journal CD review Dr. Laura G. Kafkawrites: “Vercoe musically renders Klee’s drawings with all the humor, fear, and reality that make each one leap from its canvas and dance.” Click to read Dr. Kafka’s full review. In another review published by Audiophile Audition magazine on September 26, 2013, Lee Passarella writes: "Vercoe (b. 1941) also shows a willingness to adapt different musical styles and elements to her basic idiom: the essential atonality of her music is leavened with some well-chosen pop influences where appropriate to the subject matter at hand. That includes Kleemation, a work based on drawings by Swiss modernist painter Paul Klee. Klee's sometimes whimsical, sometimes troubling art turns for its inspiration to the uninhibited world of the child artist." from the opening of the title piece. Click here to preview p1 of the flute and piano score for Kleemation. Piano score, 27 pages; Flute part, 11 pages; Total, 44 pages; PDF $16.95. For those who would prefer to purchase a printed hard copy of this piece, rather than the PDF download offered here, our print edition of Kleemation for Flute and Piano by Elizabeth Vercoe is available from Amazon, under Books (sheet music). Click to view the listing of the NSM print edition on Amazon.com. Or, order a print edition directly from NSM for $26.99 plus a $5.95 shipping and handling fee. Due to prohibitively high international shipping rates, we ship print editions only to addresses in the USA. Please use the Contact Us form to let us know which hard copy publication(s) you would like to purchase, along with your email contact information and USPS mailing address. We will then send you a PayPal invoice for the sale and, once we receive notice from PayPal that you have paid for the item(s), we will ship your music to the address provided.